Therefore, from autumn 2014, Spangler will also be able to provide its customers with reliable solutions for the new platform. The TIA portal links hardware and software into one system, and in this way creates an integrated engineering system. At SPANGLER, a four-person development team has worked on adapting the portal to different applications, and has configured individual customer solutions on the basis of the Siemens technology. “As a reliable partner for new developments, we wish to provide our customers with the necessary safety during a system change,” says Thomas Zenk, Head of Process Automation at SPANGLER, on the objectives of this project. 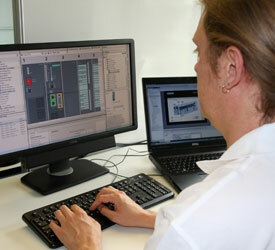 Configuration of the hardware in the TIA portal: Tobias Graf. 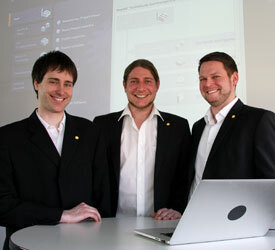 They have conducted intensive tests on the TIA portal: (l. to r.) Daniel Rengnath, Johann Weiher, Thomas Zenk. Not in photo: Tobias Graf.